NEW YORK, New York, February 10, 2014 (ENS) – New York Attorney General Eric Schneiderman announced Sunday night that his Organized Crime Task Force, OCTF, has pulled off “the largest cockfighting takedown in New York State history.” This weekend’s operation is the largest known rescue of fighting roosters in New York’s history, and among the largest in U.S. history. This is the first known investigation in which the Prohibition of Animal Fighting law was enforced in three separate New York counties at once – in New York City’s Queens County and Kings County, also known as Brooklyn, and in Ulster County north of the city in the Mid-Hudson Region. While 70 people were initially detained at a cockfighting event, nine felony arrests were made, and as many as 3,000 birds, as well as cockfighting-related contraband, were rescued in the bust. “Cockfighting is a cruel, abusive and barbaric practice that tortures animals, endangers the health and safety of the public and is known to facilitate other crimes,” said Attorney General Schneiderman. The Organized Crime Task Force unit was assisted with the “Operation Angry Birds” investigation by the American Society for the Prevention of Cruelty to Animals, which also helped to collect evidence and remove and shelter the seized birds. On Saturday night and into Sunday morning, law enforcement officials raided a cockfighting event on Jamaica Avenue in Queens, busting 70 people, including bettors and spectators. Six people, who had brought and fought birds, were charged with felony Prohibition of Animal Fighting. The others were released. 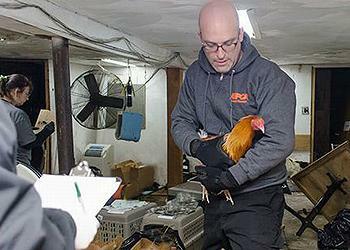 The ASPCA took control of 65 fighting birds. The ring had been operating bimonthly events there since at least May, when OCTF first began monitoring cockfighting at this location. At the same time, OCTF investigators executed a search warrant at Pet NV, a pet shop owned by Jeremias Nieves, 74, on Central Avenue in Brooklyn. Fifty fighting birds in poor condition were rescued from the basement beneath the pet shop, where cockfighting contraband and implements were found. Nieves was arrested and charged with Prohibition of Animal Fighting. On Sunday morning, law enforcement raided a farm in Plattekill, a town about 70 miles north of New York City. The Ulster County Sheriff’s office provided physical surveillance, and the Department of Homeland Security provided aerial surveillance. The ASPCA recovered 3,000 birds at the farm, which officers say had operated for years under the guise of a live poultry farm. “Its owners hid thousands of makeshift cages within the center of the property to avoid detection by neighbors and law enforcement,” alleges the Attorney General’s Office. Farm manager Manuel Cruz, 60, and Jesus Cruz, 37, a farm hand, were arrested and arraigned, and are due back in Plattekill Town Court Monday. Roosters and chickens were found to be boarded in deplorable conditions at the Plattekill farm. The owners charged rent to board, feed, and care for roosters that were bred and trained for fighting. The Attorney General’s Office alleges that blood sport enthusiasts and rooster owners from New York City, Long Island, New Jersey, Pennsylvania, Connecticut, and Massachusetts boarded, trained and fought their roosters there. Roosters from this farm are alleged to have been transported to the cockfighting event raided in Queens and also to the Brooklyn pet shop that was raided. These roosters were shot up with performance-enhancing drugs, had razor-sharp gaffs attached to their legs and were locked in a small pen to be wagered upon. At cockfighting events, spectators were charged an admission fee and another fee for a seat within the secret basement location that housed the all-night fights. Alcohol was sold without a permit, and drugs were used openly, the Attorney General’s Office alleges. “This ring had security personnel who frisked attendees, counter-surveillance within the neighborhood, security cameras and a paid referee. Owners and spectators placed bets on the outcomes of the fights, with individual wagers reaching $10,000. These fights, which began in the evening and lasted into the early morning hours, pitted dozens of roosters against one another to fight to the death,” said the Attorney General’s Office. Cockfighting is a crime in all 50 states. In New York, cockfighting and possession of a fighting bird at a cockfighting location are felonies, and each charge carries a maximum penalty of four years in jail and a fine of $25,000. The misdemeanor crime of paying to attend a cockfighting event carries a maximum sentence of a year in jail and a $1,000 fine. CHARLOTTE, North Carolina, February 10, 2014 (ENS) – Duke Energy Friday stopped a leak at its coal ash pond at its Dan River Steam Station power plant in Eden, five days after a broken stormwater pipe dumped at least 50,000 tons of ash into the Dan River. Duke spokesman Jeff Brooks said today that water from the 48-inch pipe is pumped back into the 27-acre pond. “We’re still executing multiple paths to completely block the flow, on the river side and plant side,” of the pipe, said Brooks. Duke says the ash basin dam along the river “has not been affected and remains secure.” Work continues to stabilize the bank erosion on the inside of the ash pond, closest to the retired power plant and away from the river. The coal-burning power plant was retired in 2012 and has not produced coal ash since then. Governor Pat McCrory, a Republican, visited Eden Thursday to assess the Duke Energy coal ash spill and measures being used to control the spill so cleanup efforts can begin as soon as possible. McCrory said his priorities are to protect the “health and safety” of the drinking water both in North Carolina and in Virginia, which is downstream of the spill. Duke CEO Lynn Good called Mayor Sherman Saunders of downstream Danville, Virginia Thursday to apologize for the spill, the city said. Danville has the closest downstream water intake to the power plant but has said its drinking water is safe. Governor McCrory also expressed concern for the wildlife that may be affected by the spill. The governor said he is interested in developing a “long-term” plan for the protection of the Dan River and will seek ways to ensure such an accident does not happen again. North Carolina Senate leader Phil Berger, an Eden resident, called for a legislative inquiry into the ash spill as well as into last month’s 3.5-million-gallon sewage spill into the Haw River. The U.S. Environmental Protection Agency, which in January proposed the nation’s first coal ash regulations, said the Dan River spill is likely the nation’s third-largest ash spill. The spill is the second in the past month in which hazardous chemicals related to burning coal have threatened local drinking water. Freedom Industries spilled a chemical used to clean coal into the Elk River in West Virginia on January 9, tainting the drinking water for 300,000 residents. WASHINGTON, DC, February 10, 2014 (ENS) – W.R. Grace & Co., a global supplier of specialty chemicals, has paid over $63 million to the U.S. government to resolve claims for environmental cleanups at 39 sites in 21 states, the Department of Justice and Environmental Protection Agency have announced. The payments were made under the company’s bankruptcy plan of reorganization. W.R. Grace and 61 affiliated companies filed for bankruptcy in April 2001. In 2003, the EPA filed claims against the company to recover past and future cleanup costs at sites contaminated by asbestos and other hazardous substances. Numerous agreements to resolve the EPA’s environmental liability claims against the company and its affiliates were negotiated between April 2008 and February 2013 as part of bankruptcy proceedings. W.R. Grace’s liability for asbestos contamination in the town of Libby, Montana, was addressed in a separate June 2008 settlement that resulted in a payment of $250 million to the EPA. W.R. Grace continues to be responsible for cleanup of the Libby Mine. W.R. Grace’s payment includes approximately $54 million for the EPA. Theses funds will reimburse the agency for cleanup costs or provide funds for future cleanup at the 39 Superfund sites named in the settlement. The company agreed to pay another $9 million to other federal agencies, including the U.S. Department of Interior and the U.S. Army. The company continues to be responsible for all of the sites it owns or operates and for any additional sites that were not known or resolved under the earlier settlements. WASHINGTON, DC, February 10, 2014 (ENS) – A new national survey finds support for the U.S. Environmental Protection Agency to limit climate-warming carbon emissions from power plants. Commissioned by the Sierra Club, the survey conducted by Greenberg Quinlan Rosner Research polled 1,000 registered voters across the country from January 11-20. The survey found strong support among respondents for moving away from coal and other fossil fuels and a preference for investing in clean energy. In September 2013 the EPA proposed the country’s first Clean Air Act standards to cut carbon pollution from new power plants to combat climate change and improve public health. Power plants are the largest concentrated source of emissions in the United States, accounting for roughly one-third of all domestic greenhouse gas emissions. While the United States has limits in place for arsenic, mercury and lead pollution that power plants can emit, currently there are no national limits on the amount of carbon pollution new or existing power plants can emit. When presented with President Barack Obama’s climate plan and the proposed Environmental Protection Agency limits on carbon pollution from power plants, seven-in-ten respondents said they favor the EPA putting limits on the amount of carbon pollution that power plants can release. The pollsters found that by nearly a 2-to-1 margin, voters think the country should be investing more in clean energy sources and energy efficiency rather than in fossil fuels like coal, oil and gas (61 percent for clean energy vs. 33 percent traditional sources). A majority of voters (51 percent) “strongly” prefers investing in clean energy. Support is even higher among African-American voters (77 percent) and Latino voters (71 percent). Two-in-three U.S. voters say the issue of climate disruption is a serious problem. The majority of voters (56 percent) believe that the government already limits the amount of carbon pollution that power plants can release, which the government currently does not. WASHINGTON, DC, February 10, 2014 (ENS) – Hundreds of large oil and gas facilities in six energy boom states: Colorado, Louisiana, North Dakota, Pennsylvania, Texas, and Wyoming, are emitting a combined 8.5 million tons of toxic chemicals each year that are not disclosed to the public, according to new data compiled by the nonprofit Environmental Integrity Project. The EIP report details why the toxic emissions should be reported to the public Toxics Release Inventory, managed by the U.S. Environmental Protection Agency, but are not due to a loophole that exempts the oil and gas extraction industry from disclosure. Available online at http://www.environmentalintegrity.org/news_reports/01_30_2014.php, the new EIP data provides powerful new support for an October 2012 petition urging EPA action to close the Toxics Release Inventory loophole. The data on the impact of the reporting loophole in the six states was submitted to the EPA on January 30 by Environmental Integrity Project and 13 other groups. Environmental Integrity Project found that 395 facilities in the oil and gas extraction industry each emitted over 10,000 pounds of at least one toxic chemical, the annual threshold that would require reporting to the Toxics Release Inventory in other industries. Texas led the list of six states with 209 sites, followed by: Colorado (124); Louisiana (34); Wyoming (14); Pennsylvania (13); and North Dakota (1). Nearly 200 of the sites surpassed this threshold two or more years in a row, according to the Environmental Integrity Project. Environmental Integrity Project surveyed the industry for 10 TRI-listed chemicals, including toxics such as formaldehyde, benzene, and hexane. Toxics Release Inventory reporting requirements apply to facilities that use or process more than 10,000 pounds of any listed chemical. The facilities identified in the EIP report are far above this threshold. EIP observed that the facilities may actually be using or processing more than 500,000 pounds of each toxic chemical. “We need this industry to report that pollution to the Toxics Release Inventory where everyone can see it – just like chemical plants and other facilities have done for more than 20 years,” Schaeffer said. PORTLAND, Oregon, February 10, 2014 (ENS) – The U.S. Fish and Wildlife Service is proposing to remove the Oregon chub from the list of Endangered and Threatened Wildlife under the Endangered Species Act because it has recovered, according to the agency. If finalized, the chub would be the first fish delisted due to recovery. The Oregon chub, a small minnow found only in the Willamette River Basin in floodplain habitats with little or no water flow, was listed as endangered in 1993 and reclassified as threatened in 2010. Just eight known populations with fewer than 1,000 fish were known to exist at the time of listing in 1993. Today, the population stands at more than 150,000 fish at 80 locations with a diverse range of habitats. Agency officials credit the recovery to a 20-year partnership with the Oregon Department of Fish and Wildlife, the Army Corps of Engineers and private landowners. The primary factors that threatened Oregon chub were loss of habitat and predation by nonnative fishes. These threats have been lessened over the last 20 years through collaborative partnerships to restore and acquire habitat, promote natural water flows, and conduct education and outreach to local landowners and residents; efforts that were accompanied by the reintroduction of chub into historical habitat. Other partners include the Service’s Willamette Valley National Wildlife Refuge Complex, USDA Forest Service’s Willamette National Forest, Oregon Parks and Recreation Department, Oregon Department of Transportation, McKenzie River Trust, Cities of Salem and Stayton, and Confederated Tribes of the Grand Ronde, all of which manage habitats that support Oregon chub populations. The Service now has up to one year to determine whether the proposal should become final. The Service opened a 60-day public comment period on February 6 to allow the public to review and comment on the proposal and provide additional information. Along with the delisting proposal, the Service also is proposing to remove the species’ critical habitat designation throughout its range. Twenty-six species have been recovered and removed from the Endangered Species List under the 40-year-old Endangered Species Act.